So this is what Empty Nest Syndrome must feel like. Jacob has been gone for three nights and finally – FINALLY – gets home this afternoon. We’ve never gone more than 24 hours without speaking to one another. Even on the rare night when we’re apart, we always call to talk about the day and say goodnight. Don’t get me wrong. I’m not one of those moms who is glued to my child’s side 24:7. You can often hear me say something like, “Shoo! Go play! I’m reading the paper!” I have no problem leaving him home by himself for several hours at a time. In short – totally not a helicopter parent. But this long stretch with no contact at all is really terrible. I’m walking through the rest of my life feeling like something major is WRONG. Oh, yes – one of my children is AWOL. That must be it. So I’ve taken the afternoon off so that I can be there when the bus pulls in. I will try not to cry. Hopefully he won’t be too embarrassed by his blubbering mother to let me give him a good, long hug. So my oldest left town yesterday to go on the annual fifth grade field trip. They go for four days and three nights to a camp about an hour away, and spend their time doing team-building exercises, working on science experiments, and exploring nature. It sounds great. But it was hard to see him go. He’s never been away from us this long. And it’s really AWAY – there is no contact. I can’t call up and chat before bed. Well, I probably could, but I don’t want the poor kid to be laughed at because of his high-strung mother. This trip has reminded me of the class trip I went on in the seventh grade. We did a school exchange program with a small town in California’s central valley called Coalinga. It’s a farming town, about as different from Berkeley as you can get. My best friend, Jane, and I stayed with a girl whose name was Alma. She and her family were immigrant farm workers. Their house had burned down several years before, and the only thing that had survived was a photo album that someone had grabbed as they were running out of the house. They were poor. Their house was tiny. All three of us slept together in a twin bed. We had Kraft macaroni and cheese for dinner. Alma and her family were so nice – we were fast friends. Most of the other kids in our class stayed with kids on the other side of the tracks. They had guest rooms and game rooms and swimming pools. They had fun, but I think Jane and I were lucky to meet Alma and her family. We stayed in touch for several years – I wonder where she is now? Anyway, the reason I was thinking about this trip is that I was thinking I’m so glad that they’re doing this in the fifth grade and not the seventh grade. Seventh graders get into trouble. The hormones are starting to rage, some kids are starting to experiment with drugs and alcohol. In the fifth grade, the most trouble they’re going to get into is someone’s going to try to smuggle in an iPod or something. I remember on the bus on the way back from Coalinga, we were playing truth or dare in the back of the bus. Every time a teacher would look back, we’d all shut up and stare out the window and look bored, and then we’d go right back to it. Anyway, I kissed Chris Larson. It was a dare. My first kiss was a dare. I was so grossed out (no offense, Chris!) that when I got home I actually washed my mouth out with soap. You’d think I would have just thoroughly brushed my teeth, but I guess that wasn’t going to be good enough! So – Jake comes back on Thursday. I’m expecting him to be very dirty and very tired. And wearing a big smile. And I’m pretty sure he won’t have kissed anyone on a dare. 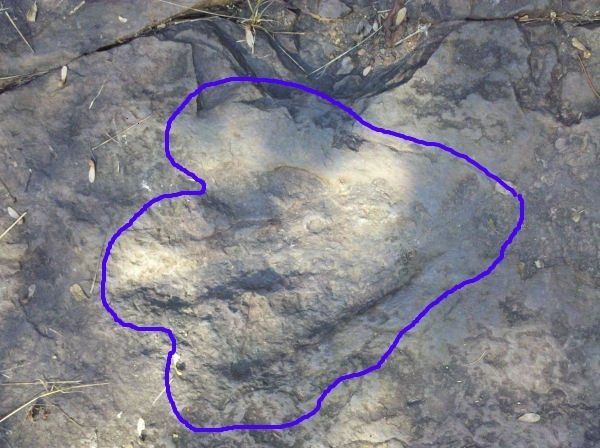 How have we lived here for so long and never managed to make it to see the dinosaur footprints? 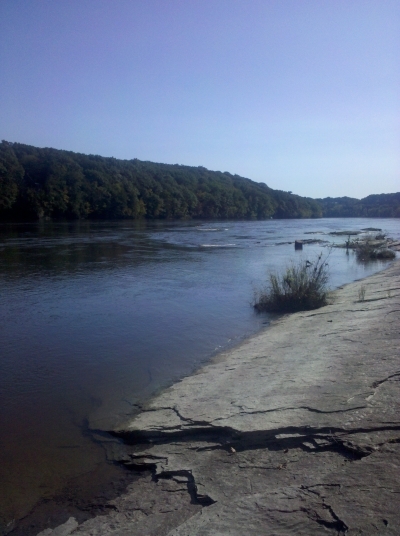 About 10 minutes away from here, right on the banks of the Connecticut River, there are actual, fossilized dinosaur footprints. We’ve heard about them, but it took a visit from my college roomie and her 3 year old, dinosaur obsessed cutie-pie to actually get us there. I’m not sure quite what I was expecting, but it certainly isn’t what we saw. 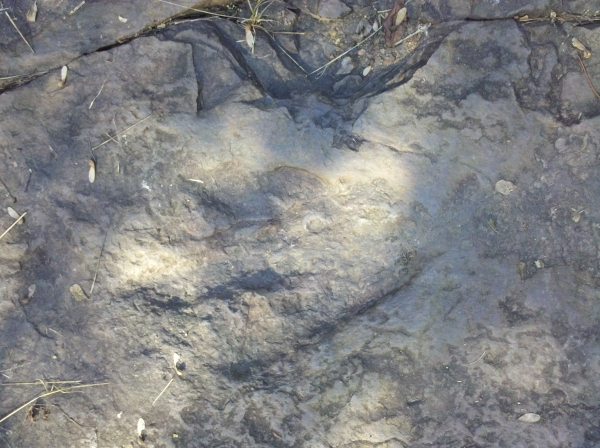 Which was REAL DINOSAUR FOOTPRINTS! Unfortunately, I don’t have anything in the shot for scale, but my hand fits nicely inside that footprint. So, we were walking exactly where dinosaurs – large dinosaurs – walked millions of years ago. 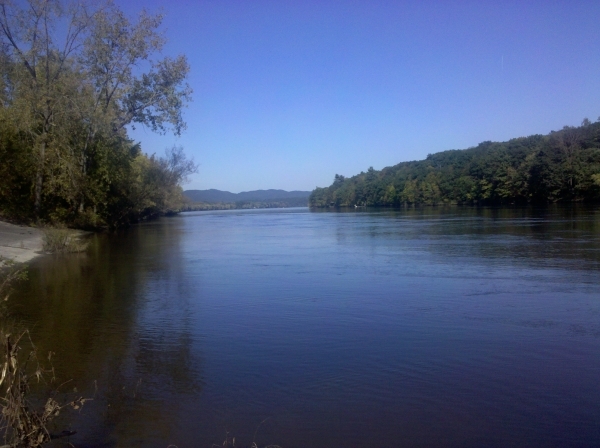 A short hike downhill and over the railroad tracks leads to the Connecticut River, where we stopped to hop around on the rocks and otherwise enjoy the unseasonably beautiful, warm weather. 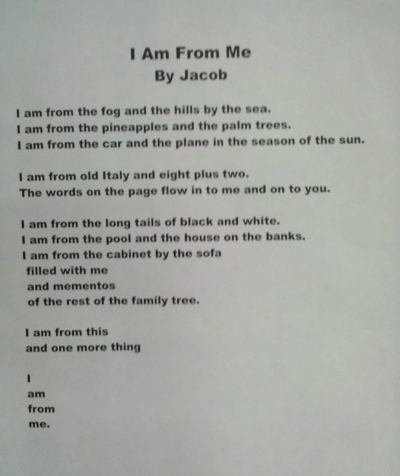 It’s probably because I know Jake so well, and I know exactly what the imagery in his poem means to him, but I had to hold the tears back when I read his poem. I still get weepy reading it. Just the fact that this amazing boy thought about his life, and the places that have shaped it, and could put it into such beautiful words… I’m verklempt. 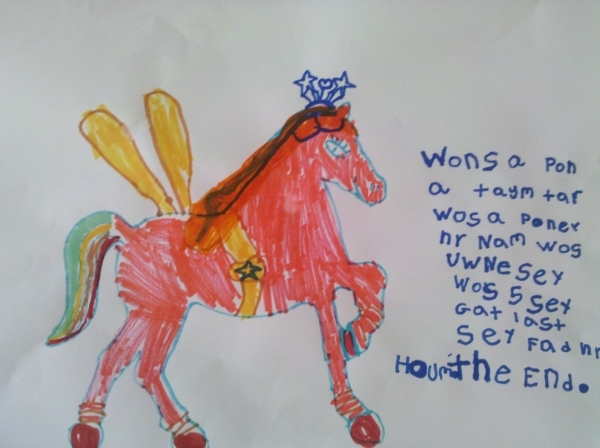 Once upon a time, there was a pony. Her name was Uni. [I’m thinking that’s short for unicorn.] She was 5. She got lost. She found her home. The end. Quite the illustrator, too, isn’t she?